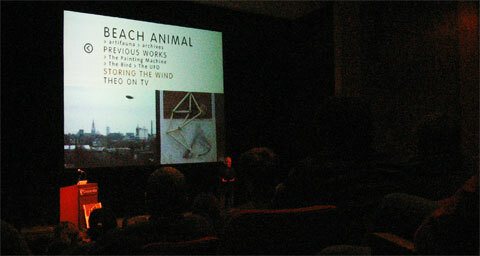 In occasion to 'The Defiant Imagination Lecture Series 2008' Concordia University's Faculty of Fine Arts presented Theo Jansen on January 23. Dutch born Theo Jansen creates large-scale kinetic sculptures, which he calls 'Strandbeests' or 'beach animals'. Having a background in science and fine arts, Jansen is interested in creating something new by trying to forget the existing. The animals are made out of plastic tubes, but Jansen experiments with all sorts of material, such as wood or steel. About 17 years ago Jansen found out the so-called 'twelve holy numbers' that determine the proportions of the animals’ legs, explained in Jansen's book ‘The Great Pretender'. These legs function basically as a reinvention of the wheel. Perfectly equipped, they have the ability to be able to go forward on the uneven beach sand without resistance. The animals use also special advices, like air filters that correspond to nerves, an invention, which makes them pup air in themselves to be able to walk even if there is no wind. Or the hammer advice, which makes them automatically hammer them in the sand once a storm comes up. Powered by the wind, these creatures live their lives on beaches, until they die. Theo Jansen's continuous work process can be followed throughout his web cam.